I’ve prepared simple users table with columns: first_name, last_name, uid. The uid value needs to be unique. 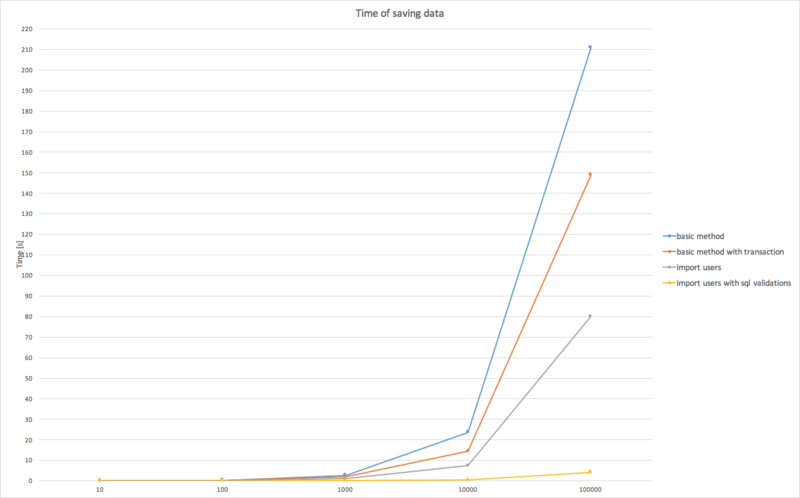 In my examples I only want to measure time of saving data into database. I don’t want to show how to import data from CSV file to database. I use CSV files as a simple source of data for my examples. Be careful, load all data from csv file at once by CSV.read(CSV_FILE) method can be dangerous, your server would run out of memory if the file is too big. You should load data in small chunks. …and pass the array to User.create method. We create separate SQL transaction for each record - BEGIN … COMMIT block. It means that Rails needs to connect to database for each record, so we end up with 100,000 connections. We want to check if each user has unique uuid, so we execute SELECT query for each record, it gives us 100,000 queries. If the uuid of user is unique we saves the record into database with next query INSERT INTO, there are next 100,000 queries. 100,000 SQL transactions and 200,000 SQL queries - this certainly affects the importing time of our data. First we will try to decrease number of transactions. We will wrap all of our queries in one transaction. Let’s decrease the number of SQL queries. In SQL we can pass multiple values to INSERT INTO query, why then ActiveRecord (in our example) creates a new query for each value? Unfortunately I don’t know why, but if we want to save all of our data in one query we need to use extra gem activerecord-import. It adds import method to our models which can take an array of column names and an array of arrays (array with our data). This method was performed by 80,004s. It’s two times faster than previous attempt. It looks impressive, it seems that the number of queries is the primary cause of a long runtime of previous methods. Below you can see an example of SQL code for two records generated by our method. We can see that all queries are wrapped by one transaction, for each record we have SELECT query which checks if uid is unique and we have one INSERT INTO query with all records at the end. This method is based on this line. Recently PostgreSQL provided INSERT ... ON CONFLICT functionality (only available in 9.5 and higher). It allows us to define what should be done when the record is not unique. With activerecord-import we will ignore duplicated keys. Yes, we got it! We’ve saved all records during the 4.213s. It’s twenty times faster than the previous method, it’s fifty times faster than the first method. I’m proud of it. In the simplest case when we have two users to save and one of them doesn’t have unique uuid, generated SQL code would look like below. We have only one INSERT INTO query, that’s all. It’s amazing that in all cases there would be 1 SQL query and 1 transactions, no matter how many records we would save, in first method there was 200,000 queries and 100,000 transactions. I know Ruby on Rails is a high level web framework and I love Rails for that. But it’s important to know how things work at deep level. When we learn how Rails and ActiveRecord magic works we can speed up the import of records to database a lot. Table and chart show that the best way is using ActiveRecord::Import with validations on database side. I know it’s a really simple case, without any other validations, but you can treat it as a hint how to use SQL validations to speed up saving data to database.